I try my best to help other artisans who reach out to me and ask for my opinion. Whether it’s an after shave or a shaving soap I always try and give them good feedback. 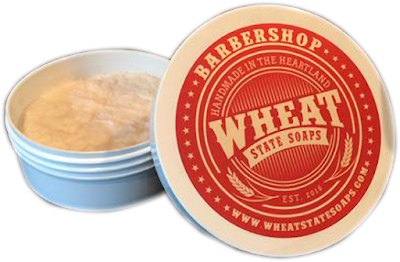 Sometimes life just gets in the way as it did with Keith from Wheat State Soap. I just didn’t have to time to send him my feedback but now things have settled down and more than ready to contribute. I’m also allowed to do a video which was not allowed before so don’t forget to check that out as well. According to Keith the packaging has changed from the tin which is what I received to a plastic tub. I do like tins they have that classic look to them but now a day’s plastic just seems like the better vassal. I really like the logo it reflects the “Made in The Heartland” feel to the product. The label sports the website url along with the scent of choice. On the bottom label, we have the ingredient list along with 4.5 oz and the URL again. I would like to see the oz on the top label but that's just me nitpicking. The lather was off the charts fantastic. I could have used less water but still managed to create a very impressive amount. A rich creamy lather that had impressive slickness and glide with great coverage. I was able go over spots several times without fear of razor burn. 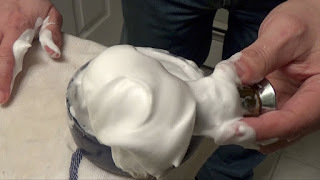 So, I really enjoyed Keith’s Sweet Tobacco shaving soap. The best part is I also have a sample of his Barbershop and Cedar Sandalwood to use. The scents on them are just as intoxicating.